1st-3rd graders getting set up for the next play. 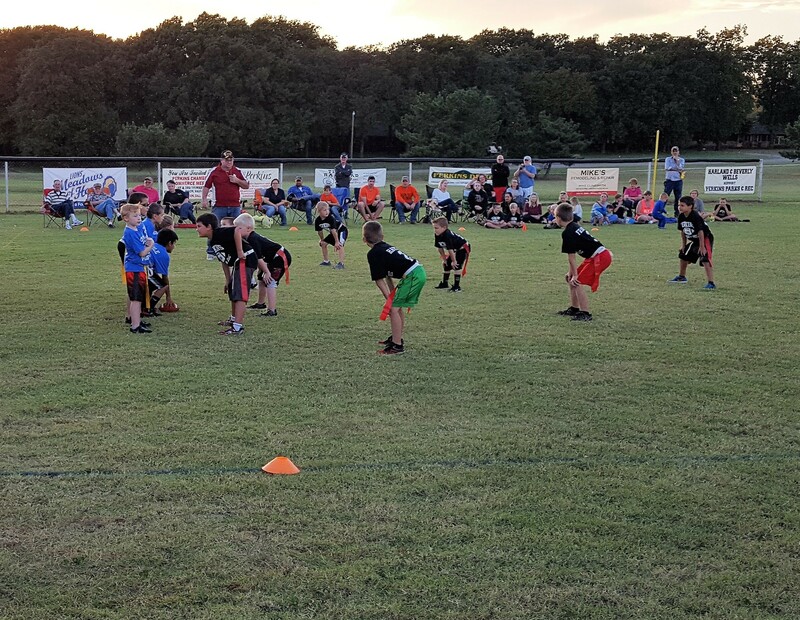 For the Official Flag Football Rules and Regulations click here. Fees: $50.00 per child. The registration fee covers the child's uniform and participation medal at the end of the season. Early registration fees are $50.00 per child this fee includes the child's uniform and participation medal at the end of the season. Late registration fees are $60.00 per child this fee includes the child's uniform, participation medal at the end of the season, and the late registration fee of $10.00. Pre-K through 3rd grade boys and girls - teams will be coed. Teams will be divided into two divisions Pre-K and Kindergarten and 1st - 3rd graders. Players do not have to be residents of the Perkins. Any adult over the age of 18 is allowed to coach. All coaches must complete and sign a "Request to Coach Form" pass a criminal background check and Child Abuse Registry Background to coach. Coaches must attend the Mandatory Coaches Meeting and Draft Night that will be held Friday Sept 14th at 5:30pm after the registration period. The coaches meeting will be at the Vassar Community Center (730 N. Plaza Dr.). Games will be held in the evenings: Tuesday and Thursdays. All practices and games will be held at Peters Park (West of Elementary School). The T-Ball fields will be converted to flag football fields. Jersey (t-shirt with front design and name and number on back), flags, footballs, and cones. Pictures will be taken for additional cost through the vendor.